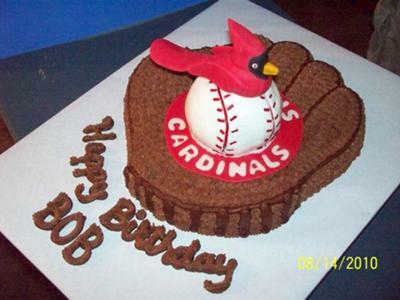 For this St. Louis Cardinals cake, I used the Wilton ball glove cake pan and a small glass bowl for the ball. I used one cake mix and reserved enough mix to make the ball. I iced in chocolate buttercreme and used a large round tip and a star tip. I iced the ball in white buttercreme and did the laces with red licorice. The bird is made of a mixture of gum paste and fondant. It's tail is supported with a popsicle stick on the bottom. The white words and red circle are fondant.